RIP, Wright King. | 50 Westerns From The 50s. « 60 Years Ago Today. Great that he lived so long. 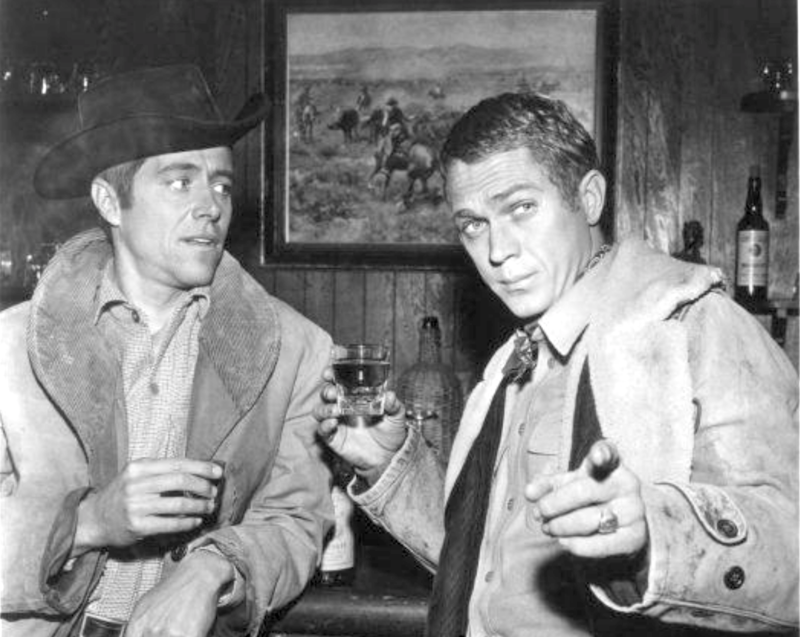 I would like to see an outreach and interview of the remaining western, noir and crime movies of the fifties. Boyd Magers used to do a little of this, not sure if he still does. Tom, I hope that most of the these actors, actresses, writers, producers, directors, photographers, and everyone that were involved in making movies and TV shows, back in the day, leave some kind of written or oral interviews behind. Wright King did, and he had plenty of stories. Madman Entertainment in Australia have released MAN OF THE WEST 2 with Audie Murphy with 6 westerns and a bonus war film . JOE BUTTERFLY isn’t really a war film but more of a “service comedy” set in Japan in the 50’s. It has only previously been available in a British DVD release. I would like to see a USA release, maybe at least from Universal Vault. An actual war movie would be BATTLE AT BLOODY BEACH, which has been out on DVD but not in widescreen as far as I know. Graham and Texican, I like JOE BUTTERFLY(1957), It’s not your usual Audie Murphy movie, but I like it. I haven’t seen it a many year, but it was fun watching a service comedy with actors like Audie, Charles McGraw, and George Nader, because they weren’t known for comedies. I think, that like Glenn Ford, Audie had a knack for this kind of movie. very impressed I was too-it’s an excellent transfer. Dern. The trailer looks very good but the film gets terrible reviews on imdb. Secondly there’s THE TIMBER which gets better reviews. best reviews of the lot. where’s WICHITA,GUNSMOKE IN TUCSON and OREGON PASSAGE. the best Toby commentary so far. John K ,sorry but none of those titles ,including the Australian one are familiar to me.PONY EXPRESS is a good film .The LAW AND ORDER combo from Sidonis arrived yesterday .WINCHESTER 73 combo from them still has not arrived ,but they are sending a replacement .There is talk around of THE WILD BUNCH being remade with possibly Mel Gibson directing .I do wish they’d leave those classics alone .THE BLUE KNIGHT and HANG ÉM HIGH are both on their way from Shout Factory .A while back on FWOT50s it was mentioned that Criterion may release THE NAKED SPUR .Any more updates on that. Correction ,THE BLUE KNIGHT is from WB Archives not Shout Factory. Everybody seems to dig the Lisbon commentary. With its rocky production, I think having that info helps you appreciate the film for what it is, and overlook a few of its faults. I’m more of an Emmylou Harris fan than a Linda Rondstat one. But she’s great. John K, I first saw PONY EXPRESS(1953) on the NBC SATURDAY NIGHT AT THE MOVIES in 1967. Being a youngster, I thought it was great. Although, I knew it wasn’t historically accurate, because I had read BUFFALO BILL: BOY OF THE PLAINS(1948) book, which was one of the “Childhood of Famous Americans” series of books. Bill Cody was fourteen- years-old, in 1860, when the company of Russell, Majors & Waddell started the Pony Express. James Butler Hickok(Wild Bill) was twenty-three years-old and wasn’t employed with the Pony Express. Fact is, neither Cody or Hickok were Pony Express riders. In 1857 eleven-year-old Willie Cody was a messenger boy for Russell, Majors and Waddell Company. On horseback, Cody delivered messages from their store in Leavenworth, Kansas to Fort Leavenworth, which was three miles away. With the above said, I still like PONY EXPRESS. First of all, don’t look for this movie to be a History lesson, because this it is a fictionalized story loosely based on Historical events. 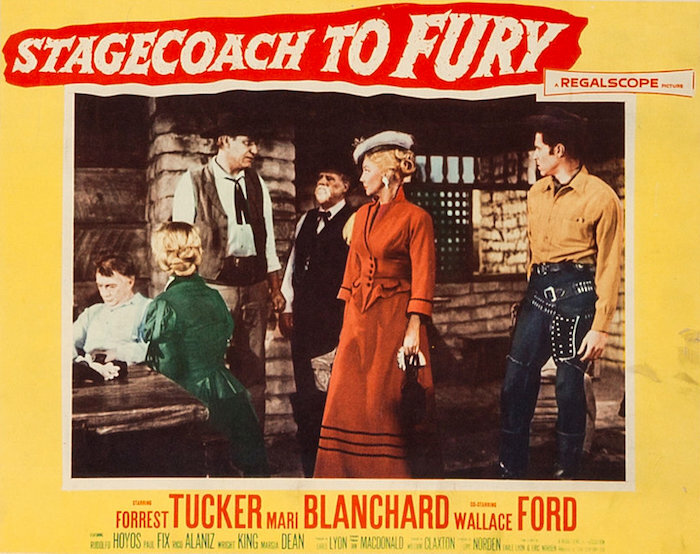 Is it a good entertaining Fifties Western? I think it is. The beginning is spectacular, with Cody we see a buffalo hunt in a very beautiful landscape accompanied by splendid Technicolor. The beautiful photography of Ray Rennahan and his camera crew in the wondrous outdoor landscapes of Arizona and Utah. How about the spectacular filming of the relays where horses and riders are changing on the run. A lot of unsung work went into the making of this Western. John K, I probably like this movie almost as much as you do, so I can’t end without saying how good I liked the two lead actresses Rhonda Fleming and Jan Sterling. Fleming shinning in Technicolor and the hoyden(I guess I can still use the term) Jan Sterling, both of whom are rivals for Bill Cody. I think Sterling is the more engaging of the two, and I can’t help but feel for her as the spitfire frontier woman, whose infatuation for Cody goes unrequited. Also, what other movie gives us two bathing beauties humorously bantering back and forth. Another tip of the hat to Toby for his commentary on Kino’s “Old Ironsides” (1926) release. Lot of good info there, and the print was excellent. I frankly didn’t even recall the subtle little ‘head-chopping’ scene that occurs in battle, from my previous viewings. Anyway, the film is a great companion piece to Cruz’ other epic, “The Covered Wagon” 1923). So exciting to have these in blu. I would have purchased the film regardless, but leading-lady Esther Ralston was a big selling-point for me. She was a rather beloved figure amongst the Cinecon crowd, and it was at one of those conventions I sat at a table with her and happily listened to her reminisce about the old days of Hollywood and the silent era. What a dear old lady she was. A real sweetheart. I became a devoted fan of hers right then and there. It’s just a shame that most of her films from her stardom days at Paramount are lost, from her signature film, “The American Venus” (1926), to Joseph Von Sternberg’s last silent, “The Case of Lena Smith” (1929). Early on, before all that, she was leading lady in quite a few westerns, for cowboy stars like Pete Morrison, Hoot Gibson, and Roy Stewart. The only one I know of circulating is that early Ken Maynard silent “$50,000 Reward” (1924), which is indeed a lot of fun. Shows Maynard really emulating the Mix style right away. Also great that Ralston capped off her leading-lady years in a western, playing wildly against type as the hillbilly gal in “To The Last Man” (1933) with Randolph Scott. Probably the most brutal western to come out of the 1930s. I still get a kick out of how the film’s climax involves a physical brawl not between the hero and villain, but the villain and leading-lady! Don’t see that too often. Luckily, the film’s public-domain status has kept this one an easily accessible fixture for years, unlike those ‘lost’ silents. You’re the first person to mention Old Ironsides. Glad you liked the commentary. What a movie, and it looks terrific. Bert Greene, I’ll have to track down OLD IRONSIDES(1926). James Cruze was a top-notch movie maker. Were you ever able to see the movie on the big screen at one of the cinema conventions? I recall Leonard Maltin talking about viewing it at a Washington D.C. Cinecon. Leading lady Esther Ralston was there in person. I envy your having been able to meet and visit with silent screen stars. I’ve read where Ralston gave her last interview in 1981. Did you see her before that year? I know that she was still acting on stage as late as 1974 in ARSENIC AND OLD LACE. TO THE LAST MAN(1933) is a good movie. I first saw it almost thirty-seven years ago on PBS Channel 10 WKNO-TV Memphis, Tennessee. On Saturday’s they were showing movies from the 1930’s and ’40’s. Also, a cartoon, short, newsreel, and coming attractions. Just like it was at the time in theaters. The story hits close to home in my case, because my family on the maternal side was involved in a feud between families. They had the same last name, but were not related kinfolk. My Grand Uncle Bob said of the other family. “I can whip them all, except ‘Little’ Guy. Guy D____ was a pure mean one, for sure. He whipped is own father when they were at the local store in the town of Red Stripe. Walter, I’ve seen a few dozen silent films on the big screen, but not “Old Ironsides.” Esther Ralston appeared at several Cinecons, but this wasn’t too many years before she passed away. After revolving regional locales, the Cinecon stayed at the Hollywood Roosevelt for a number of years, starting in 1990. Those early-90s Cinecon shows had more old-time movie folk than you could shake a stick at. Dozens each year. One show had a lot of leading ladies from the horror films, like Mae Clarke, Fay Wray, Gloria Stuart. Even Frances Drake (from “The Invisible Ray”) showed up briefly at the banquet. Lew Ayres, Cesar Romero, many, many others. I missed the show with Frances Dee and Alice Faye, and I still regret that to this day. Anyway, this is all when I lived out in LA for a while. In terms of silent-era veterans, Eddie Quillan and Patsy Ruth Miller (Esmerelda in 1923’s “Hunchback”) appeared at that old Silent Movie Theater in Hollywood for some screenings. Met them, and Priscilla Bonner, who was great in “The Red Kimona” (1925). There were indeed still a handful of those silent-era folks around, and LOTS from the 1930s and 1940s. I went to about every film-oriented function that took place, and had a few connections that got me into some private events and parties. Wasn’t making enough money, so headed back to TX before long. Fun times for a young film buff like me. The seemingly contradictory thing is that I’ve always been much more of a film-centric fan. Not a ‘star’ -centric one. On my bookshelves, 95% of my books are of film reference type, with maybe only 5% devoted to stars/actors/directors. Yet in a quirky way, I always really enjoyed seeing and meeting the old-time film veterans. It seemed to make the late-shows I grew up on, and the eras they reflected, seem not so disconcertingly distant. Made them more accessible and more relatable, I suppose. If that makes any sense, and I’m not sure it does. But all these events and encounters were uniformly positive. Well, except for that one incident I mentioned to you about Lawrence Tierney cursing me out, which was… just weird. Bert, thank you for answering my questions. I didn’t think that Esther Ralston gave her last interview in 1981. I’m sure she gave interviews at the Cinecon’s and probably to others, just not to THE HOLLYWOOD REPORTER. I;m familiar with all the actors and actresses you mentioned, except Priscilla Bonner. I just read that she never made a talking motion picture. Her younger sister Margorie Bonner was a minor actress. You share such good and interesting information and always sensible. Yeah, Priscilla Bonner also had a key, memorable role in John Ford’s “Three Bad Men” (1926), which is happily out on Blu-ray thanks to Kino. Olive Borden was leading lady, but Bonner had a great little part. I think most film buffs probably associate her with the Harry Langdon titles she made. any pretension to accuracy especially with Winchester’s being used in 1860. Jan comes out on top in PONY EXPRESS even so I adore Rhonda too. Freudian,even weirder, Coleen’s the GOOD gal in this one! further into what Paramount films are available to lease. International or Scotland’s Park Circus. Media have direct deals with Universal. been out in America released either by Olive Films or Kino Lorber. The Park Circus Paramount titles,however are a different matter altogether. Republic titles not so far released by Kino Lorber. THE PLUNDERERS,FAIR WIND TO JAVA and ACCUSED OF MURDER. including Lee Van Cleef as a cop! very impressive THE OUTCAST and R.G.Springsteen’s HELLFIRE. let’s hope it will not be too long before it happens. I also live in hope that Kino Lorber re-new their Paramount/Republic contract. Finally,has anyone seen this new Kit Parker Films 9 title Film Noir Collection. 3x Blu Ray set retailing at around $50 so it’s no cheap venture. Kit Parker/Darn Good Westerns sets were poor sellers. Sometimes I feel Western fans are their own worst enemies. Yes, this Kit Parker thing, leasing from Sony, sounds like a most interesting development. It could portend a lot of good releases, although experience tells me not to get my hopes ahead of myself. The box-set route is even more promising, because it could help lift a lot of titles that perhaps couldn’t quite financially justify solo releases. John K, thank you for this really good information. I will buy any reasonable priced(I have to watch my money close) Western Collection that I don’t already have. I’m really satisfied with my Mill Creek Collections. Yes, I have seen the Pine/Thomas THE VANQUISHED(1953) with John Payne, Coleen Gray, Jan Sterling, Lyle Bettger, and Willard Parker. I’m not going to get into a discussion of movies set during the Reconstruction Period, but this was a “Fun” movie. Jan Sterling was a highlight, as was Lyle Bettger. Jan was good as the “bad/good girl and Lyle was one of the best bad guys around. Would like to see Kit Parker do the Jungle Jim and Crime Doctor series too. I’m really enjoying the history lessons from Walter and Bert. Highly informative but also fun to read. I have a nice little 1991 book by John Cocchi which lists and comments on dozens of movies and is dedicated to the Cooperative Film Society which ran, I believe, in New York 1967-82. I recall mention of Esther Ralston and her husband attending one of their film showings. Living in Britain, meeting actors from Hollywood movies was never going to be plentiful (Though I did meet a few) but one time around the late 70s I found myself sitting next to Jan Sterling at the National Film Theatre and we had quite a chat. Very unassuming and a nice lady. Jerry, I have always liked Jan Sterling in just about any role she portrayed, so I am envious of your being able to visit with her. She lived in London, England from the late 1960’s onward. Your visit with her was probably about the time she portrayed First Lady Lou Hoover in the TV-Mini series BACKSTAIRS AT THE WHITE HOUSE(1979), which was filmed in 1978. Did she talk any about her movie and TV work, or life with her late husband Paul Douglas? She did indeed mention her late husband, Paul Douglas, and seemed quite surprised but pleased that I knew about him and their marriage, Walter. The occasion that we were both attending was a rare showing that night of the 1938 film, “ON THE NIGHT OF THE FIRE”, starring Ralph Richardson and Diana Wynyard and directed by Brian Desmond-Hurst. The director was in attendance that night (some 40 years after he made the film) in special company with Sir Michael Redgrave and his actress wife Rachel Kempson. In fact I found myself seated later next to Mr.Hurst and we chatted about the film. He was most charming and obviously liked the fact that this young fellow (gosh, that was me) was so interested in classic-era films. If only one could go back and replay moments. There would be so much more I would want to ask him about now…..
Jerry, this is such a good personal story. First you are sitting next to Jan Sterling and then Brian Desmond-Hurst, who also directed the 1951 version of A CHRISTMAS CAROL starring Alastair Sim. Thank you for sharing this really neat reminisce. This is off topic, and I apologize for the digression — but Audie Murphy is mentioned above. Does anyone know what piano waltz Gale Storm’s character plays in two pivotal scenes in “The Kid from Texas” (1950)? IMDB credits studio music for the score, but I believe this particular waltz is a classical tune. It’s familiar but I can’t place it. In the big picture. RIPWright.